You have subscription cards. It’s a necessary part of the process – bring them in with your awesome content and then you have a page that tells them how to get more and how much it costs. But, used correctly, this simple necessity can actually become part of your sales pitch. We’ve collected 10 different subscription prompt examples that each, in their own way, become part of the sales pitch, not just the process. The Dominion Post is a local news source for Morgantown, West Virginia. The Dominion Post subscription cards are a great example of a fairly standard layout. The Athletic publishes in-depth coverage of local ad national sports. They show off a variation on the standard subscription card. Simple and clean and not over-cluttered, the cards present the different options – subscription duration, cost, and content. But they also add another element: a rolling set of customer reviews. 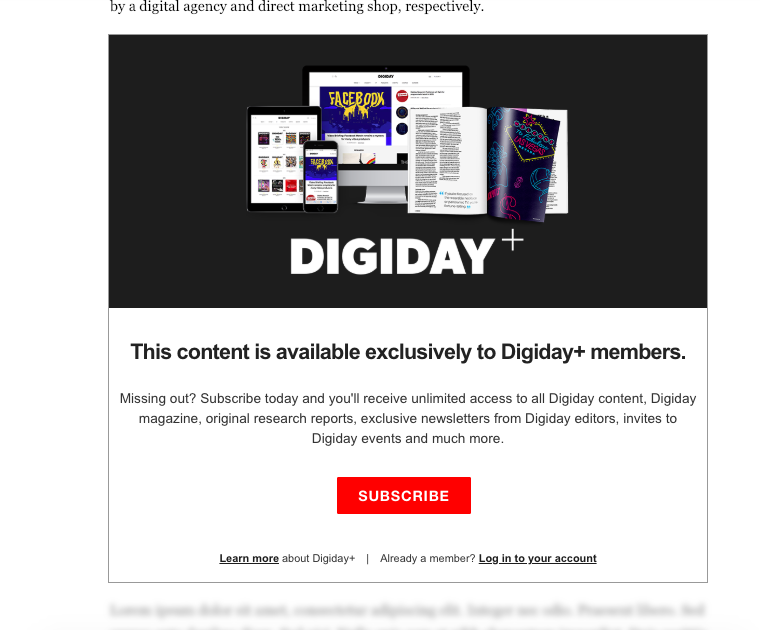 Digiday publishes content geared toward digital marketing agencies and innovators. It has a solid, traditional subscription page that lays out the different plans and options. More interestingly, it also has a subscription card pop-up on members-only content. After letting the guest read the first few lines of the restricted content, the rest is blurred out and overlaid by a simple card with an image that shows off all the content available to members and an invitation to subscribe, learn more, or log-in. The Economist’s in-depth coverage of global news is legendary. They have a traditional subscription page but also a clever pop-up subscription card. 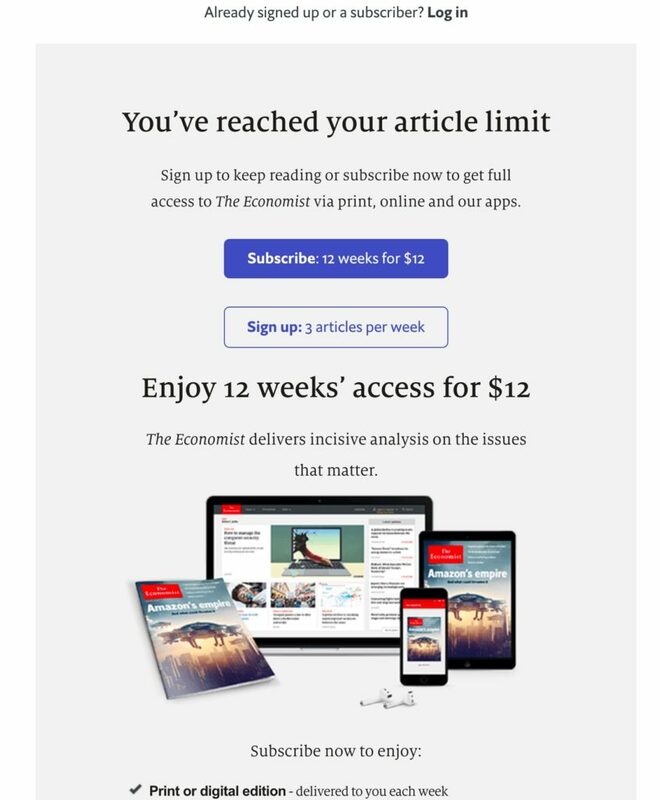 Rather than overwhelming the reader with the full glut of the weekly magazine, they offer smaller digital packages to the reader once the free articles have run out. The Correspondent is half publisher, half revolution, with a subscription card to match. 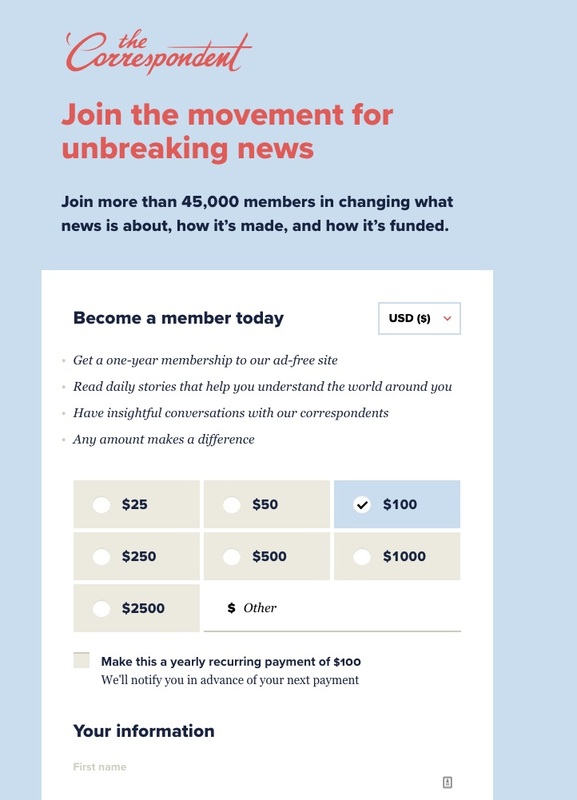 With a stated dedication to delivering “unbreaking news” – news that goes beyond sensational headlines to in-depth analysis, The Correspondent also has a different payment idea. As you can see from their subscription card, the Correspondent lets the member choose the fee. 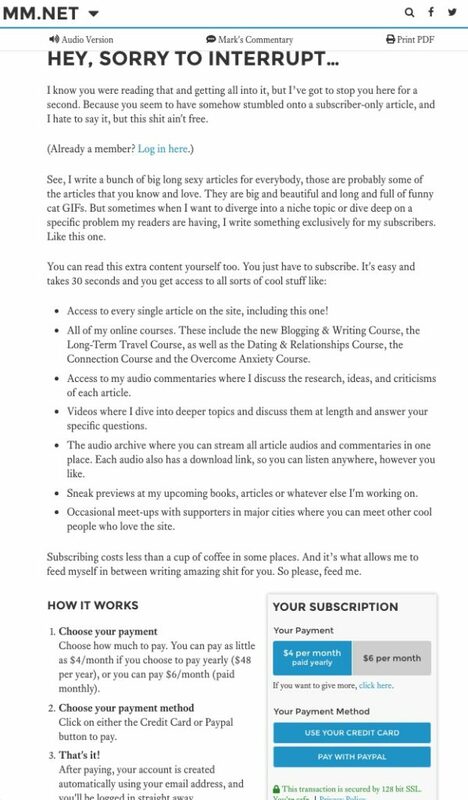 The subscription card itself is a great pitch, telling the reader what they’ll get and why it matters. Mark Manson publishes long-form reflections and life advice. His subscription card matches his tone well. It has a long, conversational explanation of why visitors should subscribe and what they can get, which is very in keeping with his voice. Then at the end is a very simple card with clear-cut options and instructions. By contrast, the Top Draw subscription card is entirely minimal, a simple explanation of what members will get. Top Draw publishes information on planning bow-hunting expeditions in the Rockies. Like Mark Manson’s, the Top Draw subscription card reflects the audience it is intended to reach. 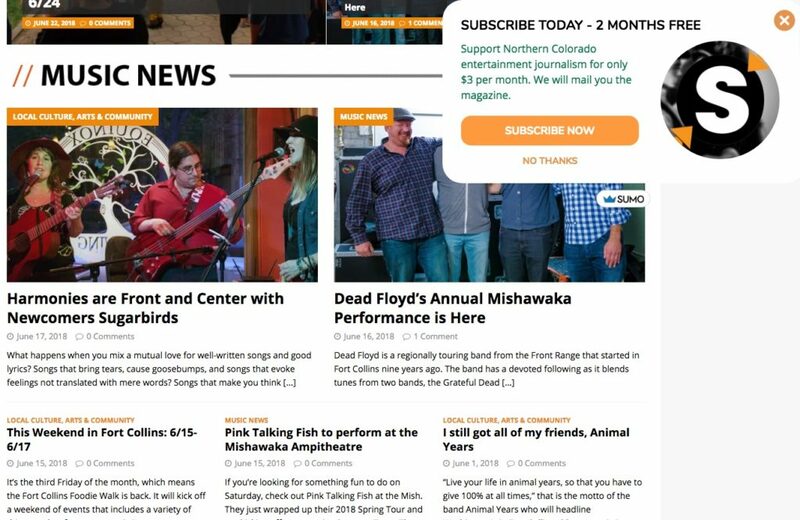 The New Scene Magazine, an off-shoot of the North Forty News, is a local source for entertainment and lifestyle news for Northern Colorado. 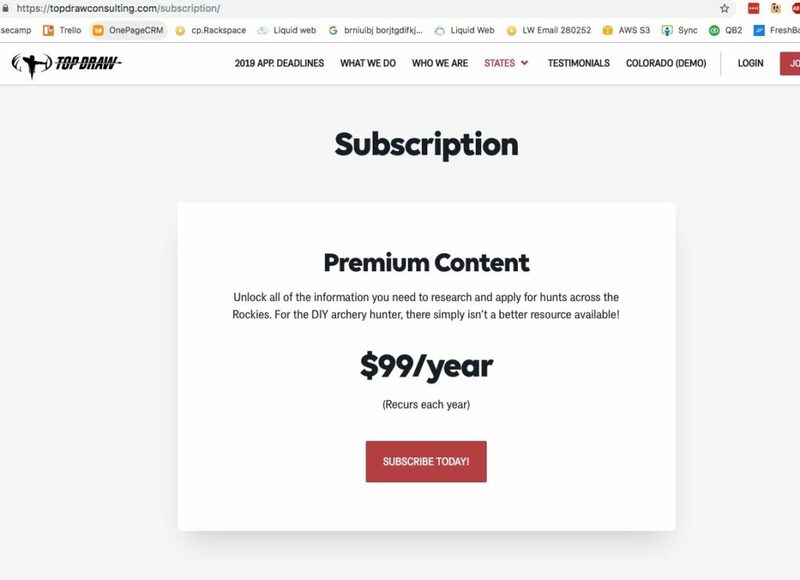 They have a traditional subscription page, but they’ve also added a pop-up that offering a good deal on becoming a subscriber – two free months for the low price of only $3 a month. 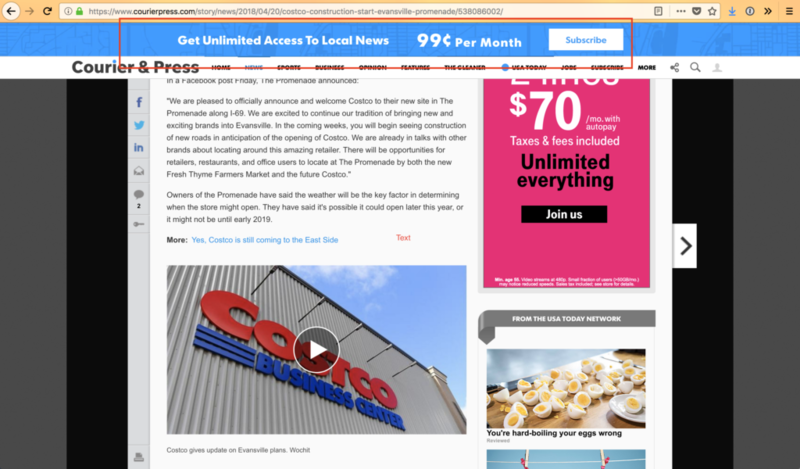 Courier & Press is a local news source for Evansville, Indiana. 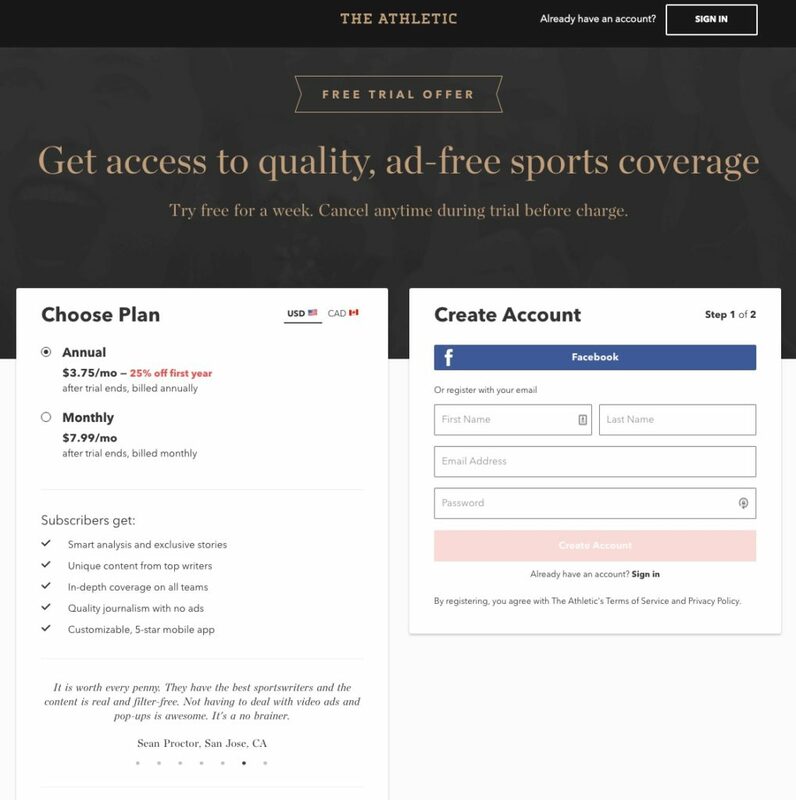 They have a traditional subscription page as well, but they’ve also added a banner to every page, luring readers in with the low price and unlimited access. …you can do too with our Leaky Paywall toolkit (a couple of the above publishers use it). Need help with your paid subscriptions? Let’s talk.